This is a sponsored post. All opinions expressed in the post are my own. If you ask me what is my favorite brand when it comes to body, hand, and home - it has to be Bath & Body Works. No wonder Bath & Body Works has been America's favorite from a long time! Their wide range of products include shower gels, body scrubs, hand creams, body creams, body lotions, hand soaps, body sprays, aromatic candles, fragrances, foot care, lip gloss etc. are much in demand everywhere. I love the fact that the brand comes up with seasonal varieties of bath and body care products which make us experience every season at its best. During my shopping at Bath & Body Works, I looked out for new arrivals like always. I was impressed seeing the Amber & Argan range which is an indulgent blend of amber, argan, quince & suede. I loved this blend so much that I added their bath and body care range to my cart. So my cart has 5 products which are Amber & Argan Body Butter, Amber & Argan Moisturizing Body Wash, Amber & Argan Sugar Scrub, Amber & Argan Fine Fragrance Mist, and Amber & Argan Body Cream. Though Bath & Body Works has an offer of buy 3 and get 2 free, my shopping cart was still pricey and that made me look out for coupon codes. Bath & Body Works allows us to use one promotion code per order and I wanted the best deal to work out. I have already subscribed to Bath & Body Works newsletter and every once in a while I get coupons to use which is great for savings. 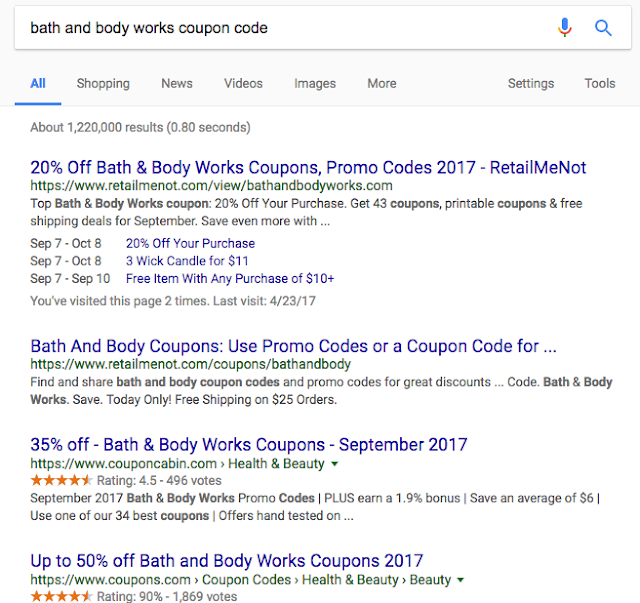 But now that I have no coupons available in my mail, I opted google search to get the best coupon code for some great savings. I did get many results which claimed various discounts such as 35% off, 50% off, $10 off etc. but not all of them work for my criteria as some codes are already expired and some do not work for the range of products I chose at Bath & Body Works. I visited the RetailMeNot site where I found some coupons. I spotted a coupon for a free item with $10 purchase but I was looking for bigger discounts as obviously I need more savings for my purchase. So after checking out some other sites, I went to my most trusted source of coupon codes - Dealspotr. For those who are not aware of Dealspotr, it is a great source which provides an up-to-date database of all the best deals online. It contains and organizes information about tens of thousands of new deals every day, and keeps that information updated in real-time. Once you create an account at Dealspotr and log in, your feed is your tool for tracking deals for the things you're interested in. You can subscribe to anything on Dealspotr, whether they are brands, topical interests, or community members. Just click the subscribe button and you'll be able to choose whether you want to see all deals or just Hot / On Fire deals for that brand or interest. They even show third-party codes which are the discount codes at other retailers that can be used to score discounts on the brand the shopper is looking for. 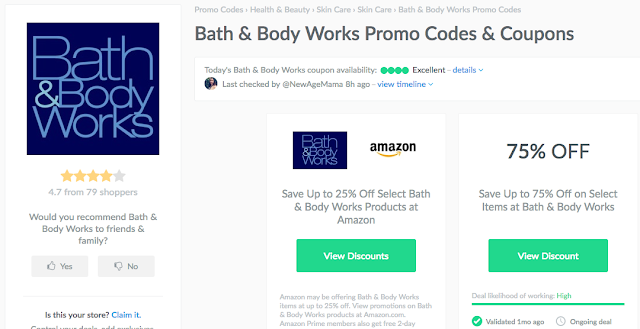 To use the Dealspotr promo codes at Bath & Body Works, all you have to do is select the items you wish to purchase at bathandbodyworks.com and add them to your shopping cart. Find a promo code on this page. Click to open the code, then click "copy" to copy the coupon code to your clipboard. Go back to bathandbodyworks.com and proceed to checkout. Look for the box labeled "Enter promo code" and paste your promo code in that box. Once you apply the promo code, your savings should be applied, and you can complete checkout. 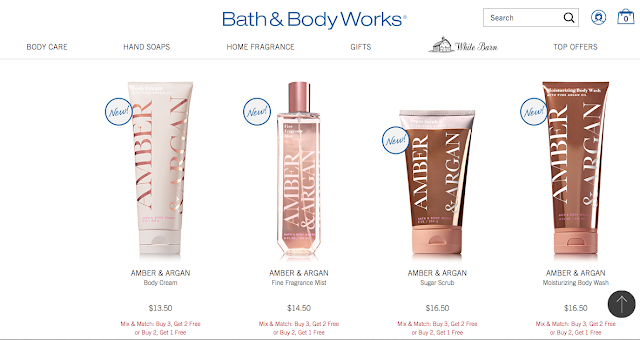 I found 2 great options which would help me save some money at Bath & Body Works shopping. I had 20% off coupon as well as free shopping promo code and I decided to go with 20% off coupon. 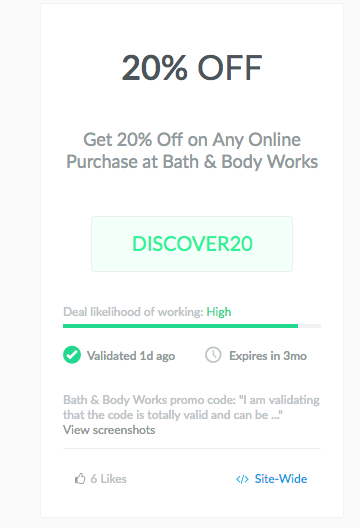 I also saw that a Dealspotr user has "validated" the deal, which means they've tested the code on the Bath & Body Works website to make sure it works. Dealspotr users do this for every deal on the site, creating a super accurate database of codes for any store, anytime. My initial cart total was $51.50 along with $5.99 shipping and handling charges. By using 20% off coupon, I got $10.30 discount which made my total shopping $47.19. Yayy!! The best thing about Dealspotr is that their community members can upload single-use coupons, often giving a site-wide discount. They can also add referral codes, giving friends and family-type discounts. Though the coupons at Dealspotr are good for one-time use, the site has so many codes any time of the day that you can shop as much as you want yet you can find a suitable promo code always. Now that you know of this wonderful site, bookmark Dealspotr where you can find 5 million coupons and advanced code-finding tools. You can now get 2,000 points if you sign up as a member which is a bonus. Become a pro by using these expert techniques, and get more discounts for any site you wish to shop at. Savings are always great and thanks to Dealspotr for helping me out with awesome promo codes.